mph, but a more realistic cruising speed was about 15 mph. Contrary to popular belief, highwheelers were not the most common type of automobiles in the very early days of motoring. The earliest cars quickly evolved into elaborate and expensive playthings of the wealthy. Highwheelers evolved out of a demand for cheap practical cars that ordinary people could afford, and that could be drive out in the farm country of the midwest over the incredibly bad roads of the period. Highwheelers became obsolete as road improved and pneumatic-tired cars became more practical (Model T Ford, for example). Kiblinger, of Auburn, IN, was one of the predominant manufacturers of highwheeler automobiles. This company was a major manufacturer of buggies and wagons in the late 1800's and progressed into automobiles. In about 1909, the firm changed ownership, and the name changed to McIntyre. McIntyre produced a myriad of models of motor vehicles, ranging from simple highwheelers, to luxury pneumatic-tired automobiles, to commercial trucks. Mr. Virgil DeWitt was a Swedish immigrant who ended up settling in Auburn, IN. He married an Auburn woman and was associated with the Kiblinger company, and later, the McIntyre company. As the boom in highwheeler cars got underway, Virgil DeWitt arranged to build a manufacturing facility in North Manchester and produced at least two models of highwheelers under the name of DeWitt Motor Vehicle Company. The DeWitt vehicles were virtual copies of McIntyre vehicles. The engine, mechanism, and chassis appear to be identical to McIntyre models, with perhaps minor differences in bodies and accessories. In fact, Mr. W. H. McIntyre was the major stockholder of the DeWitt Motor Vehicle Company. The two models that are known to have been produced by DeWitt Motor Vehicle Company are the two seater runabout and the two seater light truck. In the early 1970s several interested persons researched the history of DeWitt Motor Vehicle Company. A few of the key milestones will follow, quoted from articles in the Manchester Journal between 1908 and 1910. Association and V. L. DeWitt. This contract provides that the association shall turn to Mr. DeWitt what is known as the Eagle lot, lying west of the Big Four tracks, and south of Main street, which is valued at six hundred dollars, and shall pay him fifteen hundred dollas in money, he on his part to erect a building of brick or cement blocks not less than 35 X 125 feet two stories high, to be used as a factory for auto buggies, of the same kind that Mr. DeWitt has been using on the street here for some time. A force of five masons is at work under the direction of Elsworth Hamilton, of Auburn, who has the contract, and the blocks are being placed rapidly in position. Within two weeks with favorable weather it is expected that the building will be ready for the roof, and from then the work will go rapidly. Over the country generally there is more attention being paid to the landing of this factory by North Manchester than there is at home. It is known that it is connected with the Kiblinger factory at Auburn and that factory is having more work than it can handle. Reliable information states that the Auburn factory recently landed an order for nearly a million dollars worth of these machines. 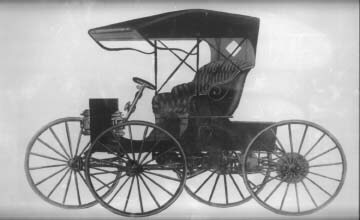 Many of the Kiblinger auto buggies are in use in this state, and are recognized as one of the best, if not the best of buggy automobiles. every way. The top, storm front, and upholstering all harmonize nicely with the color of the rig, and it is a beauty. Another feature about it is that it is all made in North Manchester. The machinery part is machined and fitted together here. The body was finished and decorated here. The top was made here, and the upholstering was done here. It is not certain as yet where the machine will be sent, but there is a demand for this type of rig that will take all of them that can be made this year. It was about three months ago that work was first commenced in the factory, but all the time has not been consumed on this one machine. There are about a dozen others that are nearly ready for completion, and after this bunch is made, work will be hurried along faster, and more machines will be kept under way all the time. At present there are about twenty people employed in the factory, and it is a busy place. A considerable amount of curiosity not only on the part of the employees of the factory but from the citizens of the town as well has been centered around this first machine manufactured. It has met the demands made of it and was given some rigid tests before it was finally finished, painted, and varnished. It met all these tests, and the machine seems to be an ideal one for any one wanting a light machine for good general service. ...The men who quit were all drawing their three dollars a day, and their places cannot be filled at once. None of them went to the management to make any inquiries whatever as to the cause of the dismissal of Kessler. It causes a considerable amount of inconvenience to the factory as it was really just getting started and in a few days would have been turning out the machines rapidly. As it is now only a few men are working, but it is the intention to secure more as quickly as possible, and to soon have another force at work. June 10, 1909 So far as the DeWitt automobile factory is concerned the sympathy strike of a few weeks ago is now only a memory. There is a full force of men at work there now, and all of the machines are running full time. Automobiles are being made at the rate of four a week or a little better, and are being sold as fast as they are being made. So far none of the machines have been put into service in this immediate vicinity, but one is going through the course of construction there now that will probably be used by a local man. The machines are handsome and are showing excellent results as light drivers. A short time ago one of the leading automobile journals in speaking of the so called buggy automobiles gave the Kiblinger car the highest standing among the machines of that character. The DeWitt machine is really the Kiblinger, being made from the same designs, and same patterns, and by the same company, though the Kiblinger is made at Auburn. machines, and the company stands back of its every machine and statement. You are invited to go to the factory and see how they are made. You will be given every attention and full information. There is nothing cheap about the car but the price. If you can use one, now is the time to get it. The DeWitt car is a winter machine as well as a summer one. It is the machine for the man who wants service. Let us show you why. Only one grade. Not how cheap, but how good. Fire that started in the second story of the DeWitt automobile factory Friday evening completely gutted the building and badly damaged the cement walls. The Fire was discovered just as the men were leaving the factory after their days work. Charles Ulrey was the first to see it, and he saw a little smoke coming from the floor under the paint room. He called to others that there was a fire, and grabbing a bucket of water ran to the second floor. There he found that the fire had such a start that there was no use even using his bucket of water. The east partition of the paint room was made of light lumber. By the side of this and outside of the paint room was piled a lot of bodies for automobiles. These were blazing like a furnace when he reached the head of the stairs. building burned rapidly. The side walls were of cement, but the second floor was of light pine, while the roof was of tarred paper and burned fiercely giving off hugh clouds of black smoke. The start of the fire is a mystery. Rodney Sherman, the painter, had been working in another part of the building and had not been in the paint room during the afternoon. He had walked past the pile of bodies as he left the building at quitting time, and there was no indication of fire then, but it was discovered before he was more than a block away from the building. In the building were seven automobiles completed or nearly completed, and these were all burned. There was a considerable quantity of the various part for automobiles and all of these that would burn were lost. The iron working machinery is not injured except by the water and the dampness to which it has been subjected. Practically all of the books and papers of the institution were destroyed. An effort was made to get into the office by breaking a window from the outside, but the building was so full of smoke that no one could enter it. Mr. DeWitt had been keeping many of his papers at home, but a few days before had brought most of them to the office to get some information from them for the assessor so the books and accounts of the concern were practically all destroyed. The walls are badly injured, and will have to be half torn away before they can be rebuilt to any advantage. Insurance on the building and stock is about $13,000. The managers were unable the first of this week to make an estimate of the loss in dollars and cents, as it will take considerable work to arrive at the value of the goods destroyed and what it will take to replace the building. The DeWitt Motor Vehicle Company was incorporated, the heaviest stockholders being V.L. DeWitt of this city, and W.H. McIntyre, of Auburn. They have been manufacturing an auto buggy, and commenced operation over a year ago, their machine being recognized as one of the best of the buggy machines ever placed on the market. The factory is well equipped with the very best of machinery. plans until the insurance is adjusted. One thing is agreed, however, and that is their new machine will be a different pattern, being built on standard automobile lines with low wheels. Thus we see that DeWitt and McIntyre realized that the highwheeler era of automobiles was coming to a close. The DeWitt factory was never rebuilt. By an interesting coincidence, three DeWitt automobiles were exchanged for fire insurance coverage shortly before the fire occurred. In the early 1970's, North Manchester native and local businessman Pudge Egolf became very interested in the DeWitt automobile history. Pudge had located one original DeWitt, located in Ottawa, IL. This DeWitt is still the only original known to exist, and is the two seater light truck model. It was not for sale at that time, but the owner did allow persons from North Manchester to view it on a few occasions. In 1973 Pudge Egolf took the challenge of fabricating a working facsimile of the DeWitt automobile. His team did this job in the remarkably short time of 30 days, having the vehicle ready for the Fun Fest parade. This vehicle has been operated for special occasions over the years, and was subsequently donated to the North Manchester Historical Society. In 1981 Pudge approached me with the idea of producing a high-quality reproduction of DeWitt automobiles for sale. The two of us did tackle this project, and between 1982 and 1985 twelve automobiles were completed and are now scattered around the world. This was a large undertaking. The reproductions were intended to be very authentic, with the exception that modern engines, bearings, brakes and paint would be used. Patterns were fabricated for the numerous castings required. Iron castings were produced by the North Manchester foundry, and brass castings by the Vice Brothers foundry in Wabash. Fortunately, the Amish still manufacture buggy wheels, seats, and tops, and several Amish shops in northeast Indiana were used for these items. Nearly all of the remaining fabrication was performed in North Manchester. Both the two seater runabout and the two seater light truck were reproduced by the new DeWitt Motor Company. In addition, a four seater touring car was developed. It is not known whether the original DeWitt was ever made in this configuration, but it is typical of highwheelers, including the McIntyre. The S/N 1 test car, a two seater runabout, was used and abused by Pudge and myself, and was driven more than 10,000 miles. It has been driven on two excursions of more than 1,000 miles each, one to Florida, and one up through Wisconsin and back through Michigan. One notable high point was the feature article on DeWitt Motor Company which appeared in the July 1984 issue of Car and Driver magazine. We took two DeWitt runabouts to Chrysler proving grounds in Detroit for performance testing and photographs. Of course, the zero to 60 MPH test had to be deleted from the test plan. The DeWitt has the honor of achieving the lowest lateral acceleration in the skid pad testing of any car that Car and Driver had ever tested. The Car and Driver editors had a great time! Unfortunately, the endeavor to reproduce DeWitt automobiles did not turn out to be financially self-supporting. Production ceased at the end of 1985, but there was nothing as spectacular as a fire this time. It will operate again, but it is not a trivial undertaking. It has not yet been decided whether to preserve the original condition of the automobile, or to undertake a restoration. Ground breaking for the germination of the Historical Society of North Manchester was first promoted by our former NEWS-JOURNAL editor, Roland Schmedel. were elected co-president and president with Mary Louise Little as vice-president. Florence Freed was appointed secretary-treasurer; Dr. Bunker and Bill Poston were to become directors; Rev. Homer Ogle, Allan Harris and Mr. Ernest Eschbach were appointed to form a constitution. Soon after, the organization started functioning and we applied and received an incorporation rating. Mrs. Freed soon learned that a combined office of Secretary-Treasurer was too complicated and involved and as a result, Elaine Hawley was elected to fill the office of secretary. It also became apparent that with the number of items streaming in that an Historian should be named. Today, Barbara Speicher fills that office. Two years ago in February, (1972) the first election was held with about 12 members present, but we have now grown into an organization numbering nearly 125. We consist of interested townspeople and some former residents who are concerned with our efforts and seem to be delighted with the advancement of the society. Many such persons have sent contributions to advance the cause. I could say that one of our goals has been to create within the townspeople and those in surrounding areas a desire to take a second look at, and be convinced that our community has something to preserve in the areas of architecture and general culture. Last week H. Roll McLaughlin, president of the Board of Directors for the Historic Landmarks Foundation of Indiana spoke at the Chamber of Commerce dinner on restorations in the U.S. and many from our own state. The restorations made in Zionsville, were directed by him and his firm. Last August he made his first visit to N. Manchester by invitation of the Historical Society and spoke to an invited public in the Indiana Lawrence Bank's Community Room. He and Mrs. Leigh Freed took a brief tour of the town and when he viewed Main Street his comment was this: "Above the first story of the business buildings no finer architecture could be found anywhere." Striving for a restoration of the original look is one of the goals set by our society. It not only will make a difference in general appearance, but will give added interest and attraction to outsiders. This spells -BUSINESS - and certainly this is a goal we are all collectively interested in. Another goal also deals with a community project such as the acquiring of a place which most people describe as a museum. There are many factors to be considered when contemplating such an endeavor. First, the historical significance, the age, the structural soundness, the cost, location, size and the general public interest would govern the choice of site and building. Yes, we have look at, we have considered, several possibilities, but, before the final decision is made I'd judge that muich more looking and consideration will take place. We have two committees appointed, one for restoration and one for acquiring and maintaining a museum. We have started a museum fund tnat will gladly accept contributions for its increase. With the museum as a possibility we have at present acquired several museum items in the form of books and publications many of which have been very generously contributed by L.W. Schultz as well as letters, pictures, clothing, china, furniture, toys, et cetera. and early settlers as told to her by her grandmother and other elderly citizens of the past, living in and around this community. The condition of the old cigar factory with its distinctive Dutch style facade is in a deplorable condition. Had a consideration for the future been implanted in the minds of young people several years ago perhaps this building might be in a less dilapidated condition than it is at the present time. Our aim is to encourage citizens to restore rather than to destroy or allow losses to occur through disregard. To date we have managed to help finance and to get donors namely the Frantz Lumber Co. to place markers at distinctive older houses and points of interest such as the Indian Trading Post which is on Main Street. In the future we will continue this practice where homes qualify for special designation. To beautify the entrance to the covered bridge the society has built up the area at the west end and planted evergreens. We wish to add to this project this summer. To do so, we have proposed the planting of decorative trees where tree lawns are large enough to accommodate such additions. We also encourage every property owner to beautify his residence in a similar manner. For the last two years we have cooperated with the Fun Fest and Child Care organization in producing material information for the house tour. Dr. Bunker has provided all of the lecture material plus arranging for slides taken by Mr. Allen under her direction to be shown prior to the tour itself. This year a lecture and slide program will be continued with James Overholt making the presentation. All of this is a part of winning a game. This is a game of harmony between members of the Society and a rapidly growing interest in reliving the past and relating our future to that foundation so strongly structured by our forefathers. It can truthfully be said that we have never worked with a more cooperative friendly and interested group of people. We have no county, state or federal aid from designated funds so our fund-raising projects are strictly from local donations, individual efforts and personal energies provided by the members themselves. 4 local women as seamstresses, plus 23 quilters a project of Bill Poston's conception came into being. Biddy Marks took the major responsibility of organization and after 3 months work the finished quilt was on display at the bank. The group now wishes to make another quilt for 1976, our national bi-centennial year. Another successful project was the exhibition contest of painters portraying areas listed as historical in Chester Township. This effort brought painters from Ft. Wayne, Huntington, Logansport, South Whitley, Silver Lake, Warsaw, Wabash, Etna Green and N. Manchester. All of the participants were very complimentary of our efforts in this respect and responded to the degree that we held an exhibit of 50 paintings. Those exhibiting praised the society and town for their interest in the arts and the willingness of those businesses who made donations for cash awards. We feel that this activity was another which enabled others to know that we have an active historical society and an up and coming community. The new collection of the writings of Dr. L.Z Bunker is now out and is being sold by the N. Manchester Historical Society for $15. For anyone interested in North Manchester or Dr Bunker this is something you won't want to miss. It is also an ideal gift . Any inquiries or orders may be sent to the Society at P. O. Box 361. Dr. Charles Boebel has compiled this collection. The collection is in the form of a neat soft-bound book. We hope you will send in your renewal for this newsletter and/or membership promptly renewing for one or two years especially since we are setting up a new system of record keeping. Contributions will be welcome, too. The dream for a museum on Main Street may become a reality this next calendar year and that and the completion of the Marshall House restoration are our two major current projects. Several volunteers are spending time at the Marshall House doing some of the jobs that are next in line.